Viking’s filter section has a signature analog sound that you might want to use on other parts of your mix. It has both low pass and band pass configurations. 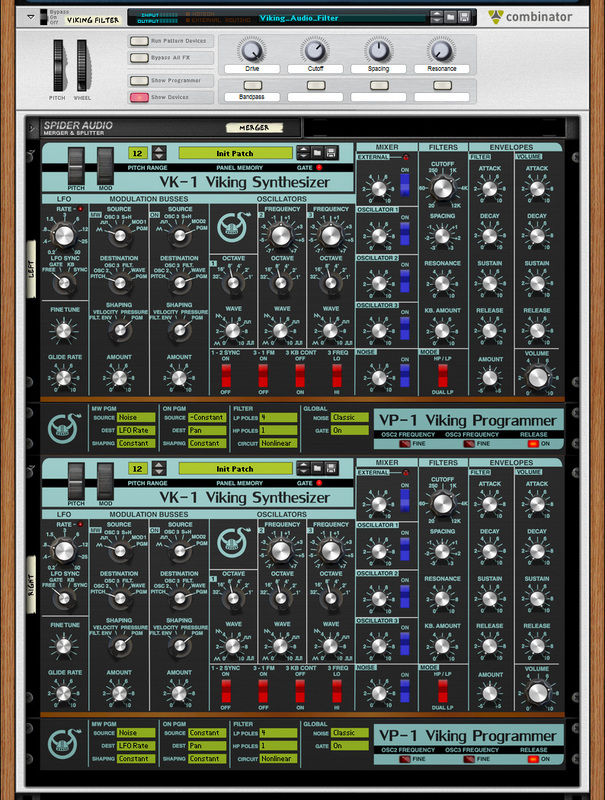 This tutorial explains how to use a Combinator patch that has two Vikings set up for filtering audio. It’s a great sounding and easy to use filter. The Combinator controls consist of four knobs and one button. The Drive knob adjusts the gain into the filter. The Cutoff knob adjusts the cutoff frequency. Viking actually has two filters and Spacing controls the difference in cutoff frequency between them. The Bandpass button switches the filter from lowpass to bandpass mode. There are a few things that aren’t obvious when you first try the filter. Like what does the Spacing knob really do. Spacing changes the cutoff frequency of the left channel vs the right. In lowpass mode, if you set the spacing to 63 in the Combinator, the cutoff frequencies of both channels are equal. Each number on Viking’s Spacing knob shifts the cutoff frequency of the left channel by one octave with respect to the Cutoff knob, for a maximum of 3 octaves difference. When the filter is in bandpass mode the Spacing knob also controls the frequency difference between the filters, but in this case one is a highpass filter and the signal passes through both in mono. The knob has a slightly different numbering system. When the knob is turned all the way to the right the bandwidth is most narrow, with the highpass one octave below the lowpass. As the knob is turned to the left the highpass frequency decreases by one octave per number on the Viking knob, which is effectively widening the pass band. There is an aspect of Resonance that is not obvious. Resonance occurs in the lowpass filters but not in the highpass. So resonance in the bandpass configuration means lowpassed with resonance and highpassed without resonance. There are also some options for the filter available in Viking’s Programmer section. The number of poles affects the steepness of the filter cutoff. Selecting fewer poles in a filter allows more signal energy in frequencies past the cutoff point to pass through, increasing the perceived bandwidth. So less poles will give a more open sound. The circuit options provide two DSP methods that both model the same filter. The linear method uses less CPU, it is a highly tuned model that uses traditional DSP methods. The nonlinear method uses what is commonly referred to as circuit modelling. It provides soft clipping but requires more CPU horsepower. Both are good models and in many cases it is hard to tell the difference. This should get you going with the Viking filter. The Combinator is intended to provide a good starting point for filtering audio. If you have comments or questions, leave them below. But how does one inserts this effect in Reason to an audio track for example ? Click Show Insert FX on the audio track. Then use the To Device and From Device jacks to hook up the filter.